For the Baroque style in a more general sense, see Baroque art. Basilica di Superga near Turin: Filippo Juvarra. The seventeenth and early eighteenth centuries marked the Baroque period in Europe and the Americas. The period was characterized by a fluidity of design accented by a sense of drama. The architecture of the period departed from the traditionalist forms seen in Renaissance designs and moved toward grander structures with flowing, curving shapes. Baroque architects often incorporated landscape design with their plans and were responsible for many of the great gardens, plazas and courtyards of Italy. Beginning in the early seventeenth century in Italy, Baroque architecture took the humanist Roman vocabulary of Renaissance architecture and used it in a new rhetorical, theatrical, sculptural fashion, expressing the triumph of absolutist church and state. The term 'Baroque' was actually a reference to deformity, and Borromini's church of St. Carlo was evidence of that: unhinged and perverse. New architectural concerns for color, light and shade, sculptural values and intensity characterize the Baroque. Whereas the Renaissance drew on the wealth and power of the Italian courts, and was a blend of secular and religious forces, the Baroque was directly linked to the Counter-Reformation, a movement within the Catholic Church to reform itself in response to the Protestant Reformation. The Council of Trent (1545-1563) marked the beginning of the Counter Reformation. The Baroque played into the demand for an architecture that was—on the one hand more accessible to the emotions and—on the other hand, a visible statement of the wealth and power of the Church. The new style manifested itself in particular in the context of new religious orders, like the Theatines and the Jesuits, which aimed to improve popular piety. 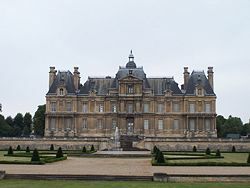 By the middle of the seventeenth century, the Baroque style had found its secular expression in the form of grand palaces, first in France—as in the Château de Maisons (1642) near Paris by François Mansart—and then throughout Europe. Michelangelo's late Roman buildings, particularly Saint Peter's Basilica, may be considered precursors of baroque architecture, as the design of the latter achieves a colossal unity that was previously unknown. His pupil Giacomo della Porta continued this work in Rome, particularly in the facade of the Jesuit church Il Gesu, which leads directly to the most important church facade of the early baroque, Santa Susanna by Carlo Maderno. In the seventeenth century, the baroque style spread through Europe and Latin America, where it was particularly promoted by the Jesuits. 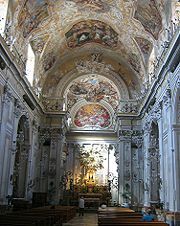 Sicilian Baroque: San Benedetto in Catania. The Italian Baroque was possessed by a spirit of exuberance that stemmed from the Mannerist conventional style. It first came to surface in the 1630s and soon encompassed all of Europe. The sacred architecture of the Baroque period had its beginnings in the Italian paradigm of the basilica with the crossed dome and nave. 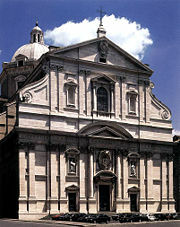 One of the first Roman structures to break with the Mannerist conventions exemplified in the Gesù, was the church of Santa Susanna, designed by Carlo Maderno. Maderno's Santa Susanna is very much like Giacomo della Porta's Il Gesú in that, "Both are two stories high, crowned by pediments; in both the lateral extension of the lower story forced by the side chapels is masked and joined to the central block by consoles; in both, the movement of the orders toward the center is dramatized by an increase in projection." The dynamic rhythm of columns and pilasters, central massing, domed roofs, and the protrusion and condensed central decoration add complexity to the structure. The differences, however, are immense. Santa Susanna is definitive and deliberate and there is an emerging sense of unity that trademarks the style of Italian Baroque architecture. There is an incipient playfulness with the rules of classical design, while still maintaining the rigor of its form. The same emphasis on plasticity, continuity and dramatic effects is evident in the work of Pietro da Cortona, illustrated by San Luca e Santa Martina (1635) and Santa Maria della Pace (1656). The latter building, with concave wings devised to simulate a theatrical set, presses forward to fill a tiny piazza in front of it. Other Roman ensembles of the period are likewise suffused with theatricality, dominating the surrounding cityscape as a sort of theatrical environment. "What Borromini and his contemporary and rival Gian Lorenzo Bernini did was to shape a new theatrical style of architecture that matched the spirit of a new era in which theater, opera, and an opulent street life had begun to emerge." At that time, there was a rapid ascent of Protestantism, and in order to re-establish Catholic dominance, the Counter-Reformation was set in motion. The best known example of such an approach is trapezoidal Saint Peter's Square, which has been praised as a masterstroke of Baroque theater. The square is shaped by two colonnades, designed by Gian Lorenzo Bernini on an unprecedented colossal scale to suit the space and provide emotions of awe. Bernini's own favorite design was the polychromatic oval church of Sant'Andrea al Quirinale (1658), which, with its lofty altar and soaring dome, provides a concentrated sampling of the new architecture. His idea of the Baroque townhouse is typified by the Palazzo Barberini (1629) and Palazzo Chigi-Odescalchi (1664), both in Rome. Not only in his architecture, but in his sculpture and painting, Bernini typifies the Baroque sensuality that is pervasive throughout its age. Sant'Ivo alla Sapienza: Francesco Borromini. Bernini's chief rival in the papal capital was Francesco Borromini, whose designs deviate from the regular compositions of the ancient world and Renaissance even more dramatically. Acclaimed by later generations as a revolutionary in architecture, Borromini condemned the anthropomorphic approach of the 16th century, choosing to base his designs on complicated geometric figures (modules). Borromini's architectural space seems to expand and contract when needed, showing some affinity with the late style of Michelangelo. His iconic masterpiece is the diminutive church of San Carlo alle Quattro Fontane), distinguished by a corrugated oval plan and complex convex-concave rhythms. A later work, Sant'Ivo alla Sapienza, displays the same antipathy to the flat surface and playful inventiveness, epitomized by a corkscrew lantern dome. Following the death of Bernini in 1680, Carlo Fontana emerged as the most influential architect working in Rome. His early style is exemplified by the slightly concave facade of San Marcello al Corso. Fontana's academic approach, though lacking in the dazzling inventiveness of his Roman predecessors, exerted substantial influence on Baroque architecture both through his prolific writings and through a number of architects whom he trained and who would disseminate the Baroque idioms throughout 18th-century Europe. In the north of Italy, the monarchs from the House of Savoy were particularly receptive to the new style. They employed a brilliant triad of architects—Guarino Guarini, Filippo Juvarra and Bernardo Vittone—to illustrate the grandiose political ambitions and the newly acquired royal status of their dynasty. Guarini was a peripatetic monk who combined many traditions (including that of Gothic architecture) to create irregular structures remarkable for their oval columns and unconventional façades. Building upon the findings of contemporary geometry and stereotomy, Guarini elaborated the concept of architectura obliqual which approximated Borromini's style in both theoretical and structural audacity. Guarini's Palazzo Carignano (1679) may have been the most flamboyant application of the Baroque style to the design of a private house in the seventeenth century. Guarini's Chapel of the Holy Shroud is a mind-boggling structural and decorative tour de force. In fact, at its height, the Baroque was a mixture of mathematical compositions and the wild and sensual. Fluid forms, weightless details and airy prospects of Juvarra's architecture anticipated the art of Rococo. Although his practice ranged well beyond Turin, Juvarra's most arresting designs were created for Victor Amadeus II of Sardinia. The visual impact of his Basilica di Superga (1717) derives from its soaring roofline and masterful placement on a hill above Turin. Rustic ambiance encouraged a freer articulation of architectural form at the royal hunting lodge of the Palazzina di Stupinigi (1729). Juvarra finished his short but eventful career in Madrid, where he worked on the royal palaces at La Granja (palace) and Palacio Real de Aranjuez. Among the many who were profoundly influenced by the brilliance and diversity of Juvarra and Guarini none was more important than Bernardo Vittone. This Piedmontese architect is remembered for an outcrop of flamboyant Rococo churches, quatrefoil in plan and delicate in detailing. His sophisticated designs often feature multiple vaults, structures within structures and domes within domes. The eighteenth century saw the capital of Europe's architectural world transferred from Rome to Paris. The Italian Rococo, which flourished in Rome from the 1720s onward, was profoundly influenced by the ideas of Borromini. The most talented architects active in Rome—Francesco de Sanctis (Spanish Steps, 1723) and Filippo Raguzzini (Piazza Sant'Ignazio, 1727)—had little influence outside their native country, as did numerous practitioners of the Sicilian Baroque, including Giovanni Battista Vaccarini, Andrea Palma, and Giuseppe Venanzio Marvuglia. The last phase of Baroque architecture in Italy is exemplified by Luigi Vanvitelli's Caserta Palace, reputedly the largest building erected in Europe in the eighteenth century. Indebted to contemporary French and Spanish models, the palace is skillfully related to the landscape. At Naples and Caserta, Vanvitelli practiced a sober classicizing academic style, with equal attention to aesthetics and engineering, a style that would make an easy transition to Neoclassicism. Château de Maisons near Paris: François Mansart, 1642. The center of baroque secular architecture was France, where the open three wing layout of the palace was established as the canonical solution as early as the 16th century. But it was the Palais du Luxembourg, by Salomon de Brosse that determined the sober and classicizing direction that French Baroque architecture was to take. For the first time, the corps de logis was emphasized as the representative main part of the building, while the side wings were treated as hierarchically inferior and appropriately scaled down. The medieval tower has been completely replaced by the central projection in the shape of a monumental three-storey gateway. De Brosse's melding of traditional French elements (e.g., lofty mansard roofs and complex roofline) with extensive Italianate quotations (e.g., ubiquitous rustication, derived from Palazzo Pitti in Florence) came to characterize the Louis XIII style. Arguably the most accomplished formulator of the new manner was François Mansart, a tireless perfectionist credited with introducing the full Baroque to France. In his design for Château de Maisons (1642), Mansart succeeded in reconciling academic and baroque approaches, while demonstrating respect for the gothic-inherited idiosyncracies of the French tradition. Vaux-le-Vicomte near Paris: Louis Le Vau and André Le Nôtre, 1661. The Château of Maisons demonstrates the ongoing transition from the post-medieval chateaux of the sixteenth century to the villa-like country houses of the eighteenth. The structure is strictly symmetrical, with an order applied to each story, mostly in pilaster form. The frontispiece, crowned with a separate aggrandized roof, is infused with remarkable plasticity and the whole ensemble reads like a three-dimensional whole. Mansart's structures are stripped of overblown decorative effects, so typical of contemporary Rome. Italian Baroque influence is muted and relegated to the field of decorative ornamentation. 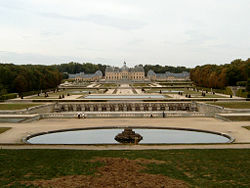 The next step in the development of European residential architecture involved the integration of the gardens in the composition of the palace, as is exemplified by Vaux-le-Vicomte, where the architect Louis Le Vau, the designer Charles Le Brun and the gardener André Le Nôtre complemented each other. From the main cornice to a low plinth, the miniature palace is clothed in the so-called "colossal order," which makes the structure look more impressive. The creative collaboration of Le Vau and Le Nôtre marked the arrival of the "Magnificent Manner" which allowed to extend Baroque architecture outside the palace walls and transform the surrounding landscape into an immaculate mosaic of expansive vistas. Les Invalides, Paris: Jules Hardouin-Mansart, 1676. There is a majestic grandeur that leads to a harmony or unification and elegance that identifies the Baroque style. The same three artists scaled this concept to monumental proportions in the royal hunting lodge and later main residence at Versailles). On a far grander scale, the palace is a hypertrophied and somewhat repetitive version of Vaux-le-Vicomte. It was both the most grandiose and the most imitated residential building of the 17th century. 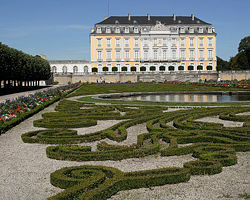 Mannheim, Nordkirchen and Drottningholm Palace were among many foreign residences for which Versailles provided a model. 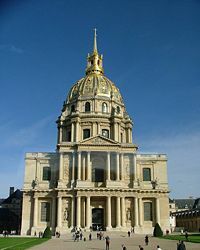 The final expansion of Versailles was superintended by Jules Hardouin-Mansart, whose key design is the Dome des Invalides, generally regarded as the most important French church of the century. Hardouin-Mansart profited from his uncle's instruction and plans to instill the edifice with an imperial grandeur unprecedented in the countries north of Italy. The majestic hemispherical dome balances the vigorous vertical thrust of the orders, which do not accurately convey the structure of the interior. The younger architect not only revived the harmony and balance associated with the work of the elder Mansart but also set the tone for Late Baroque French architecture, with its grand ponderousness and increasing concessions to academicism. The reign of Louis XV saw a reaction against the official Louis XIV style in the shape of a more delicate and intimate manner, known as Rococo. The style was pioneered by Nicolas Pineau, who collaborated with Hardouin-Mansart on the interiors of the royal Château de Marly. Further elaborated by Pierre Le Pautre and Juste-Aurèle Meissonier, the "genre pittoresque" culminated in the interiors of the Château de Chantilly (c. 1722) and Hôtel de Soubise in Paris (c. 1732), where a fashionable emphasis on the curvilinear went beyond all reasonable measure, while sculpture, paintings, furniture, and porcelain tended to overshadow architectural divisions of the interior. Valletta, the capital city of Malta, was laid out in 1566 to fortify the Knights of Rhodes, who had taken over the island when they were driven from Rhodes by Islamic armies. The city, designed by Francesco Laparelli on a grid plan, and built up over the next century, remains a particularly coherent example of Baroque urbanism. Its massive fortifications, which were considered state of the art, until the modern age, are also largely intact. Valletta became a UNESCO World Heritage Site in 1980. 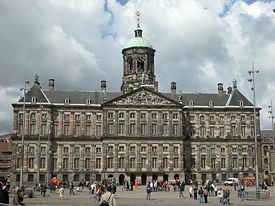 Amsterdam City Hall: Jacob van Campen, 1646. There is little Baroque about Dutch architecture of the seventeenth century. The architecture of the first republic in Northern Europe was meant to reflect democratic values by quoting extensively from classical antiquity. Like contemporary developments in England, Dutch Palladianism is marked by sobriety and restraint. 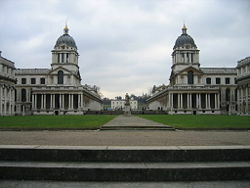 Two leading architects, Jacob van Campen and Pieter Post, used such eclectic elements as giant-order pilasters, gable roofs, central pediments, and vigorous steeples in a coherent combination that anticipated Christopher Wren's Classicism. The most ambitious constructions of the period included the town hall in Amsterdam (1646) and Maastricht (1658), designed by Campen and Post, respectively. On the other hand, the residences of the House of Orange are closer to a typical burgher mansion than to a royal palace. Two of these, Huis ten Bosch and Mauritshuis, are symmetrical blocks with large windows, stripped of ostentatious Baroque flourishes and mannerisms. The same austerely geometrical effect is achieved without great cost or pretentious effects at the stadholder's summer residence of Het Loo. Baroque Architecture in the Southern Netherlands developed rather differently than in the Protestant North. Important architectural projects were set up in the spirit of the Counter Reformation. Flemish architects such as Wenzel Coebergher were trained in Italy and their works were inspired by the works of architects such as Jacopo Barozzi da Vignola and Giacomo della Porta. Coebergher's most important project was the Basilica of Our Fair Lady of Scherpenheuvel, which he designed as the center of a new town in the form of a heptagon. The influence of Peter Paul Rubens on architecture was very important. With his book I Palazzi di Genova he introduced novel Italian models for the conception of profane buildings and decoration in the Southern Netherlands. The Courtyard and Portico of his own house in Antwerp (Rubenshuis) are good examples of his architectural activity. He also took part in the decoration of the Antwerp Jesuit Church (now Carolus-Borromeuskerk) were he introduced a lavish baroque decoration, integrating sculpture and painting in the architectural program. Greenwich Hospital: Sir Christopher Wren, 1694. Baroque aesthetics, whose influence was so potent in mid-17th century France, made little impact in England during the Protectorate and the first English Restoration. For a decade between the death of Inigo Jones in 1652 and Christopher Wren's visit to Paris in 1665 there was no English architect of the accepted premier class. Unsurprisingly, general interest in European architectural developments was slight. It was Wren who presided over the genesis of the English Baroque manner, which differed from the continental models by clarity of design and subtle taste for classicism. Following the Great Fire of London, Wren rebuilt 53 churches, where Baroque aesthetics are apparent primarily in dynamic structure and multiple changing views. His most ambitious work was St Paul's Cathedral, which bears comparison with the most effulgent domed churches of Italy and France. In this majestically proportioned edifice, the Palladian tradition of Inigo Jones is fused with contemporary continental sensibilities in masterly equilibrium. 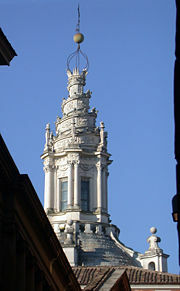 Less influential were straightforward attempts to engraft the Berniniesque vision onto British church architecture (e.g., by Thomas Archer in St. John's, Smith Square, 1728). Seaton Delaval Hall: Sir John Vanbrugh, 1718. Although Wren was also active in secular architecture, the first truly baroque country house in England was built to a design by William Talman (architect) at Chatsworth House, starting in 1687. The culmination of Baroque architectural forms comes with Sir John Vanbrugh and Nicholas Hawksmoor. Each was capable of a fully developed architectural statement, yet they preferred to work in tandem, most notably at Castle Howard (1699) and Blenheim Palace (1705). Although these two palaces may appear somewhat ponderous or turgid to Italian eyes, their heavy embellishment and overpowering mass captivated the British public, albeit for a short while. Castle Howard is a flamboyant assembly of restless masses dominated by a cylindrical domed tower which would not be out of place in Dresden or Munich. Blenheim is a more solid construction, where the massed stone of the arched gates and the huge solid portico becomes the main ornament. 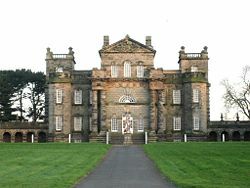 Vanbrugh's final work was Seaton Delaval Hall (1718), a comparatively modest mansion yet unique in the structural audacity of its style. It was at Seaton Delaval that Vanbrugh, a skillful playwright, achieved the peak of Restoration drama, once again highlighting a parallel between Baroque architecture and contemporary theatre. Despite his efforts, Baroque was never truly to the English taste and well before his death in 1724 the style had lost currency in Britain. French châteaux of the 17th century provided models for numerous country houses across Northern Europe. 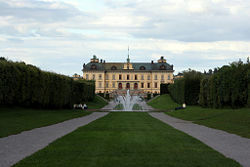 Tessin's Drottningholm Palace illustrates the proximity between French and Swedish architectural practice. During the golden age of the Swedish Empire, the architecture of Nordic countries was dominated by the Swedish court architect Nicodemus Tessin the Elder and his son Nicodemus Tessin the Younger. Their aesthetic was readily adopted across the Baltic, in Copenhagen and Saint Petersburg. Born in Germany, Tessin the Elder endowed Sweden with a truly national style, a well-balanced mixture of contemporary French and medieval Hanseatic elements. His designs for the royal manor of Drottningholm Palace seasoned French prototypes with Italian elements, while retaining some peculiarly Nordic features, such as the hipped roof (säteritak). Amalienborg, a Baroque quarter in the center of Copenhagen. Tessin the Younger shared his father's enthusiasm for discrete palace facades. His design for the Stockholm Palace draws so heavily on Bernini's unexecuted plans for the Louvre that we could well imagine it standing in Naples, Vienna, or Saint Petersburg. Another example of the so-called International Baroque, based on Roman models with little concern for national specifics, is the Royal Palace of Madrid. The same approach is manifested is Tessin's polychrome domeless, a skillful pastiche of early Italian Baroque, clothed in a giant order of paired Ionic pilasters. It was not until the mid-18th century that Danish and Russian architecture emancipated from Swedish influence. 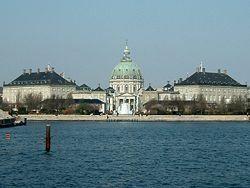 A milestone of this late period is Nicolai Eigtved's design for a new district of Copenhagen centered on the Amalienborg Palace. The palace is composed of four rectangular mansions for the four greatest nobles of the kingdom, arranged across the angles of an octagonal square. The restrained facades of the mansions hark back to French antecedents, while their interiors contain some of the finest Rococo decoration in Northern Europe. In the Holy Roman Empire, the baroque period began somewhat later. Although the Augsburg architect Elias Holl (1573-1646) and some theoreticians, including Joseph Furttenbach the Elder already practiced the baroque style, they remained without successors due to the ravages of the Thirty Years' War. From about 1650 on, construction work resumed, and secular and ecclesiastical architecture were of equal importance. During an initial phase, master-masons from southern Switzerland and northern Italy, the so-called magistri Grigioni and the Lombard master-masons, particularly the Carlone family from Val d'Intelvi, dominated the field. However, Austria came soon to develop its own characteristic baroque style during the last third of the seventeenth century. Johann Bernhard Fischer von Erlach was impressed by Bernini. He forged a new Imperial style by compiling architectural motifs from the entire history, most prominently seen in his church of St. Charles Borromeo in Vienna. Johann Lucas von Hildebrandt also had Italian training. He developed a highly decorative style, particularly in facade architecture, which exerted strong influences on southern Germany. Frequently, the Southern German baroque is distinguished from the Northern German baroque, which is more properly the distinction between the Catholic and the Protestant baroque. Augustusburg, a typical baroque palace from Westphalia. In the Catholic South, the Jesuit church of St. Michael's Church in Munich was the first to bring Italian style across the Alps. However, its influence on the further development of church architecture was rather limited. A much more practical and more adaptable model of church architecture was provided by the Jesuit church in Dillingen: the wall-pillar church, that is, a barrel-vaulted nave accompanied by large open chapels separated by wall-pillars. As opposed to St. Michael's in Munich, the chapels almost reach the height of the nave in the wall-pillar church, and their vault (usually transverse barrel-vaults) springs from the same level as the main vault of the nave. The chapels provide ample lighting; seen from the entrance of the church, the wall-pillars form a theatrical setting for the side altars. The wall-pillar church was further developed by the Vorarlberg school, as well as the master-masons of Bavaria. The wall-pillar church also integrated well with the hall church model of the German late Gothic age. The wall-pillar church continued to be used throughout the eighteenth century (e.g., even in the early neo-classical church of Rot a der Rot), and early wall-pillar churches could easily be refurbished by re-decoration without any structural changes, for example, the church at Dillingen. 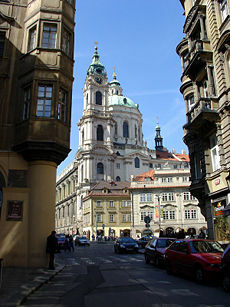 However, the Catholic South also received influences from other sources, e.g., the so-called radical baroque of Bohemia. The radical baroque of Christoph Dientzenhofer and his son Kilian Ignaz Dientzenhofer, both residing at Prague, was inspired by examples from northern Italy, particularly by the works of Guarino Guarini. It is characterized by the curvature of walls and intersection of oval spaces. While some Bohemian influence is visible in Bavaria's most prominent architect of the period, Johann Michael Fischer, e.g., in the curved balconies of some of his earlier wall-pillar churches, the works of Balthasar Neumann are generally considered to be the final synthesis of Bohemian and German traditions. Protestant sacred architecture was of lesser importance during the baroque, and produced only a few works of prime importance, particularly the Frauenkirche in Dresden. Architectural theory was more lively in the north than in the south of Germany, e.g., Leonhard Christoph Sturm's edition of Nikolaus Goldmann, but Sturm's theoretical considerations (e.g., on Protestant church architecture) never really made it to practical application. In the south, theory essentially reduced to the use of buildings and elements from illustrated books and engravings as a prototype. Palace architecture was equally important both in the Catholic South and the Protestant North. After an initial phase when Italian architects and influences dominated (Vienna, Rastatt), French influence prevailed from the second decennium of the eighteenth century onwards. The French model is characterized by the horseshoe-like layout enclosing a cour d'honneur (courtyard) on the town side (chateau entre cour et jardin), whereas the Italian (and also Austrian) scheme presents a block-like villa. The principal achievements of German Palace architecture, often worked out in close collaboration of several architects, provide a synthesis of Austro-Italian and French models. The most outstanding palace which blends Austro-Italian and French influences into a completely new type of building is the residence at Würzburg. While its general layout is the horseshoe-like French plan, it encloses interior courtyards. Its facades combine Lucas von Hildebrandt's love of decoration with French-style classical orders in two superimposed stories; its interior features the famous Austrian "imperial staircase," but also a French-type enfilade of rooms on the garden side, inspired by the "apartement semi-double" layout of French castles. Wilanów palace in Warsaw represents a modest type of baroque residence. The first baroque church in Polish-Lithuanian Commonwealth was the Corpus Christi Church in Niasvizh, Belarus (1587). It also holds a distinction of being the first domed basilica with Baroque facade in the world and the first baroque piece of art in Eastern Europe. Architects such as Jan Krzysztoff Glaubitz were instrumental in forming the so-called distinctive "Vilnius Baroque" style, which spread throughout the region. By the end of the century, Polish baroque influences crossed the Dnieper into the Cossack Hetmanate, where they gave birth to a particular style of Orthodox architecture, known as the Cossack baroque. Such was its popular appeal that every medieval church in Kiev and the Left-Bank Ukraine was redesigned according to the newest fashion. 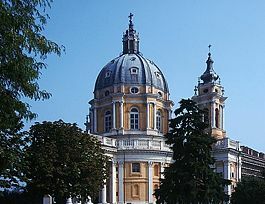 In the Kingdom of Hungary the first great Baroque building was the Jesuit Church of Nagyszombat built by Pietro Spozzo in 1629-1637, modeling the Church of the Gesu in Rome. Jesuits were the main propagators of the new style with their churches in Győr (1634-1641), Kassa (1671-1684), Eger (1731-1733) and Székesfehérvár (1745-1751). The reconstruction of the territories devastated by the Ottomans was carried out in Baroque style in eighteenth century. Intact Baroque townscapes can be found in Győr, Székesfehérvár, Eger, Veszprém, Esztergom and the Castle District of Buda. The most important Baroque palaces in Hungary were the Royal Palace in Buda, Grassalkovich Castle in Gödöllő and Esterházy Castle in Fertőd. Smaller Baroque castles of the Hungarian aristocracy are scattered all over the country. Hungarian Baroque shows the double influence of Austrian and Italian artistic tendencies as many German and Italian architects worked in the country. The main characteristics of the local version of the style were modesty, lack of excessive decoration and some "rural" flavor, especially in the works of the local masters. Important architects of the Hungarian Baroque were András Mayerhoffer, Ignác Oraschek and Márton Wittwer. Franz Anton Pilgram also worked in the Kingdom of Hungary, for example, on the great Premonstratensian monastery of Jászó. In the last decades of the eighteenth century Neo-Classical tendencies became dominant. The two most important architects of that period were Menyhért Hefele and Jakab Fellner. Two most important architectural representations of Baroque in Romania, are the Brukenthal Palace in Sibiu city, and the former Bishopric Palace in Oradea, now a state museum. 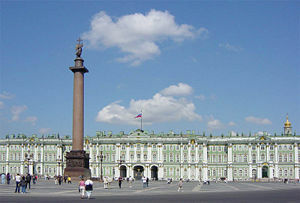 In Russia, the baroque architecture passed through three stages–the early Moscow baroque, with elegant white decorations on red-brick walls of rather traditional churches, the mature Petrine baroque, mostly imported from Low Countries, and the late Rastrelliesque baroque, in the words of William Brumfield, "extravagant in design and execution, yet ordered by the rhythmic insistence of massed columns and baroque statuary." Nothwithstanding a prodigality of sensually rich surface decoration associated with Baroque architecture of the Iberian Peninsula, the royal courts of Madrid and Lisbon generally favored a more sober architectural vocabulary distilled from seventeenth-century Italy. The Royal Palace of Madrid, La Granja, Palacio Real de Aranjuez, Convent of Mafra and Palace of Queluz were designed by architects under strong influence of Bernini and Juvarra. In the realm of church architecture, Guarini's design for Sta. Maria della Divina Providenza in Lisbon was a pace-setter for structural audacity in the region (even though it was never built). The first fully baroque church in Portugal was the Church of Santa Engrácia), in Lisbon, designed by royal architect João Antunes. Palácio do Raio in Braga,. By the mid-eighteenth century, northern Portuguese architects had absorbed the concepts of Italian Baroque to revel in the plasticity of local granite in such projects as the surging 75-meter-high Torre dos Clérigos in Porto). The foremost center of the national Baroque tradition was Braga, whose buildings encompass virtually every important feature of Portuguese architecture and design. 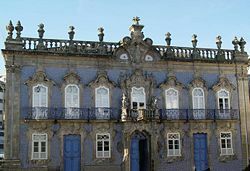 The Baroque shrines and palaces of Braga are noted for polychrome ornamental patterns, undulating rooflines, and irregularly shaped window surrounds. São Francisco de Assis in São João del Rei: Aleijadinho, 1777. Brazilian architects also explored plasticity in form and decoration, though they rarely surpassed their continental peers in ostentation. The churches of Mariana, Minas Gerais and the Rosario at Ouro Preto are based on Borromini's vision of interlocking elliptical spaces. At São Pedro dos Clérigos, Recife, a conventional stucco-and-stone facade is enlivened by "a high scrolled gable squeezed tightly between the towers". Even after the Baroque conventions passed out of fashion in Europe, the style was long practiced in Brazil by Aleijadinho, a brilliant and prolific architect in whose designs hints of Rococo could be discerned. 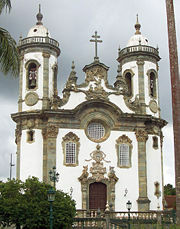 His church of Bom Jesus de Matozinhos at Congonhas is distinguished by a picturesque silhouette and dark ornamental detail on a light stuccoed facade. Although Aleijadinho was originally commissioned to design São Francisco de Assis, São João del Rei his designs were rejected, and were displaced to the church of São Francisco in Ouro Preto instead. 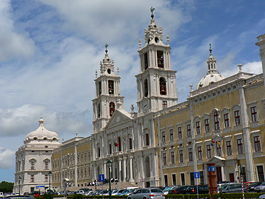 Convent of Mafra, Portugal: Ludovice,. As Italian Baroque influences penetrated across the Pyrenees, they gradually superseded in popularity the restrained classicizing approach of Juan de Herrera, which had been in vogue since the late sixteenth century. As early as 1667, the facades of Granada Cathedral (by Alonso Cano) and Jaén, Spain (by Eufrasio López de Rojas) suggest the artists' fluency in interpreting traditional motifs of Spanish cathedral architecture in the Baroque aesthetic idiom. 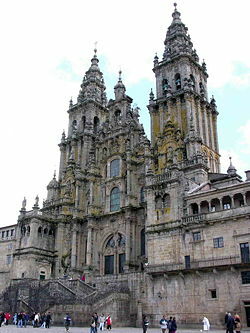 The most impressive display of Churrigueresque spatial decoration may be found in the west facade of the Cathedral of Santiago de Compostela). In contrast to the art of Northern Europe, the Spanish art of the period appealed to the emotions rather than seeking to please the intellect. The Churriguera family, which specialized in designing altars and retables, revolted against the sobriety of the Herreresque classicism and promoted an intricate, exaggerated, almost capricious style of surface decoration known as the Churrigueresque. Within half a century, they transformed Salamanca into an exemplary Churrigueresque city. Among the highlights of the style, interiors of the Granada Charterhouse offer some of the most impressive combinations of space and light in 18th-century Europe. Integrating sculpture and architecture even more radically, Narciso Tomé achieved striking chiaroscuro effects in his Transparente for the Toledo Cathedral. The development of the style passed through three phases. Between 1680 and 1720, the Churriguera popularized Guarino Guarini's blend of Solomonic columns and composite order, known as the "supreme order." Between 1720 and 1760, the Churrigueresque column, or estipite, in the shape of an inverted cone or obelisk, was established as a central element of ornamental decoration. The years from 1760 to 1780 saw a gradual shift of interest away from twisted movement and excessive ornamentation toward a neoclassical balance and sobriety. 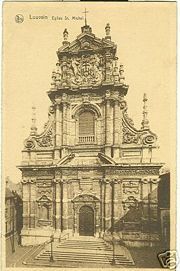 Church of St. Michel in Louvain, Belgium: Willem Hesius, 1650. Two of the most eye-catching creations of Spanish Baroque are the energetic facades of the University of Valladolid (Diego Tomé, 1719) and Hospicio de San Fernando in Madrid (Pedro de Ribera, 1722), whose curvilinear extravagance seems to herald Antonio Gaudi and Art Nouveau. In this case as in many others, the design involves a play of tectonic and decorative elements with little relation to structure and function. The focus of the florid ornamentation is an elaborately sculptured surround to a main doorway. If we remove the intricate maze of broken pediments, undulating cornices, stucco shells, inverted tapers and garlands from the rather plain wall it is set against, the building's form would not be affected in the slightest. In the wealthy Southern Netherlandish domain of the Spanish kings, Flanders, florid decorative detailing was more tightly knit to the structure, thus precluding concerns of superfluity. A remarkable convergence of Spanish, French and Dutch Baroque aesthetics may be seen in the Abbey of Averbode (1667). Another characteristic example is the Church of St. Michel at Louvain), with its exuberant two-story facade, clusters of half-columns, and the complex aggregation of French-inspired sculptural detailing. Six decades later, a Flemish architect, Jaime Borty Milia, was the first to introduce Rococo to Spain (Cathedral of Murcia, west facade, 1733). The greatest practitioner of the Spanish Rococo style was a native master, Ventura Rodríguez, responsible for the dazzling interior of the Basilica of Our Lady of the Pillar in Saragossa (1750). San Francisco de Asís Church, Lima, 1673. The combination of the Native American and Moorish decorative influences with an extremely expressive interpretation of the Churrigueresque idiom may account for the full-bodied and varied character of the Baroque in the American and Asian colonies of Spain. Even more than its Spanish counterpart, American Baroque developed as a style of stucco decoration. Twin-towered facades of many American cathedrals of the seventeenth century had medieval roots and the full-fledged Baroque did not appear until 1664, when a Jesuit shrine on Plaza des Armas in Cusco was built. Even then, the new style hardly affected the structure of churches. The Peruvian Baroque was particularly lavish, as evidenced by the monastery of San Francisco at Lima (1673). While the rural Baroque of the Jesuit Block and Estancias of Córdoba in Córdoba, Argentina, followed the model of Il Gesu, provincial "mestizo" (crossbred) styles emerged in Arequipa, Potosí and La Paz. In the eighteenth century, architects of the region turned for inspiration to the Mudejar art of medieval Spain. 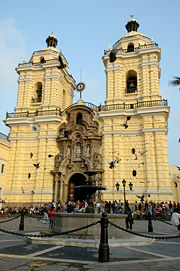 The late Baroque type of Peruvian facade first appears in the Church of Our Lady of La Merced, Lima). Similarly, the Church of La Compañia, Quito) suggests a carved altarpiece with its richly sculpted facade and a surfeit of spiral salomónica. 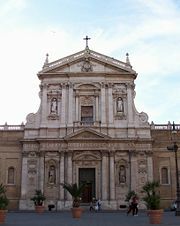 The facade of the church of Ss. 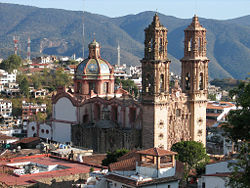 Sebastian y Santa Prisca in Taxco) bristles with Mexican Churrigueresque ornamentation. The true capital of Mexican Baroque is Puebla, where a ready supply of hand-painted ceramics and vernacular gray stone led to its evolving further into a personalized and highly localized art form with a pronounced Indian flavor. There are about 60 churches whose facades and domes display glazed tiles of many colors, often arranged in Arabic designs. The interiors are densely saturated with elaborate gold leaf ornamentation. In the eighteenth century, local artisans developed a distinctive brand of white stucco decoration, named "alfenique" after a Pueblan candy made from egg whites and sugar. ↑ Tlaxcala, interior. cal state. Retrieved November 12, 2008. Cruickshank, Dan, ed. Sir Banister Fletcher's A History of Architecture. Architectural Press, 1996. ISBN 9780750622677. Gardner, Helen. Art Through the Ages, Sixth Edition, Harcourt Brace Jovanovich, Inc. 1975, ISBN 0155037536. Glancey, Jonathan. The Story of Architecture, Dorling Kindersley Publishing, Inc. 2000, ISBN 0789459655. Hartt, Frederick. Art: A History of Painting, Sculpture, Architecture. New York: Harry N. Abrams, 1989, ISBN 0810918846. Raeburn, Michael. An Outline Of World Architecture. Octopus Books Limited, 1973. ISBN 0706402561. This page was last modified on 18 December 2012, at 16:19.